Are you looking for a tranquil life but with activities and excitement? This is the place! Santa Teresa and Montezuma are two beach towns located in the southern part of the Nicoya Peninsula, known for an extreme Pura Vida lifestyle where the hippie culture is still alive. These two beaches have been becoming more popular within young adults and backpackers. Here, you will find plenty of international restaurants and lots of foreign​​ looking for a tranquil lifestyle. Mostly known for their surf breaks in Santa Teresa and Montezuma you can also find several activities like hiking, waterfalls, canopy, and more. White sand beaches surrounded by the green nature and wildlife welcome you all year long! 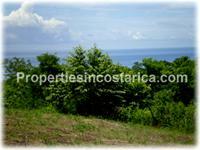 Live a Long Life on this 12 hectare Property with Ocean Views and Private Home!